Handset maker Motorola has taken preemptive legal action against rival Apple in asking a court to invalidate 11 iPhone-related patents. 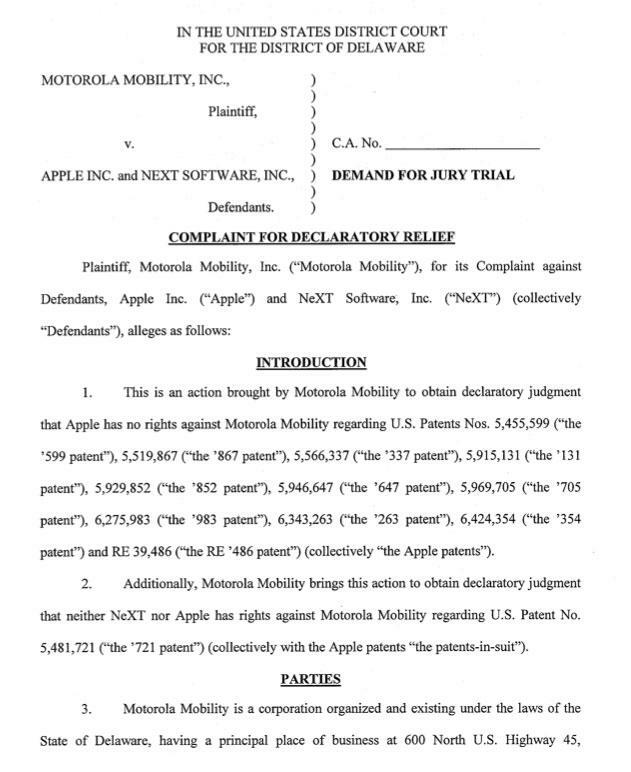 Motorola, which recently sued Apple over alleged patent violations, filed a complaint last week with a U.S. District Court in Delaware. The complaint seeks to invalidate a total of 11 patents awarded to Apple and NeXT Software, both companies founded by Apple Chief Executive Steve Jobs. The preemptive strike notes that Apple has a "history of asserting" that handsets running Google's Android mobile operating system violate the 11 named patents. Motorola's suit notes that Apple's lawsuit against handset maker HTC, filed earlier this year, includes those patents. The complaint asserts that Motorola is not infringing on the patents in question, and also attempts to prove to the court that the granted patents are invalid. U.S. Patent No. 5,455,599: "Object-oriented graphic system"
U.S. Patent No. 5,519,867: "Object-oriented multitasking system"
U.S. Patent No. 5,566,337: "Method and apparatus for distributing events in an operating system"
U.S. Patent No. 5,915,131: "Method and apparatus for handling I/O requests utilizing separate programming interfaces to access separate I/O services"
U.S. Patent No. 5,929,852: "Encapsulated network entity reference of a network component system"
U.S. Patent No. 5,946,647: "System and method for performing an action on a structure in computer-generated data"
U.S. Patent No. 5,969,705: "Message protocol for controlling a user interface from an inactive application program"
U.S. Patent No. 6,275,983: "Object-oriented operating system"
U.S. Patent No. 6,343,263: "Real-time signal processing system for serially transmitted data"
U.S. Patent No. 6,424,354: "Object-oriented event notification system with listener registration of both interests and methods"
U.S. Patent No. RE39,486: "Extensible, replaceable network component system"
Earlier this month, Motorola sued Apple, alleging that the iPhone maker has infringed on patents it owns. The lawsuit was filed through a subsidiary, Motorola Mobility Inc., with the U.S. International Trade Commission. Motorola Mobility has accused Apple of violating a total of 18 patents it owns, related to a range of technologies including 3G, GPRS, 802.11 wireless, and antenna design. Specifically named Apple products include MobileMe and the App Store. Given the numerous lawsuits and countersuits filed with the ITC involving Apple, it is likely that the iPhone maker will respond in kind to Motorola with a lawsuit of its own. In addition to legal battles with Motorola and HTC, Apple is also at odds with Nokia and Kodak.